to keep it from feeling too formal. Do you like mixing it up or a more traditional style? 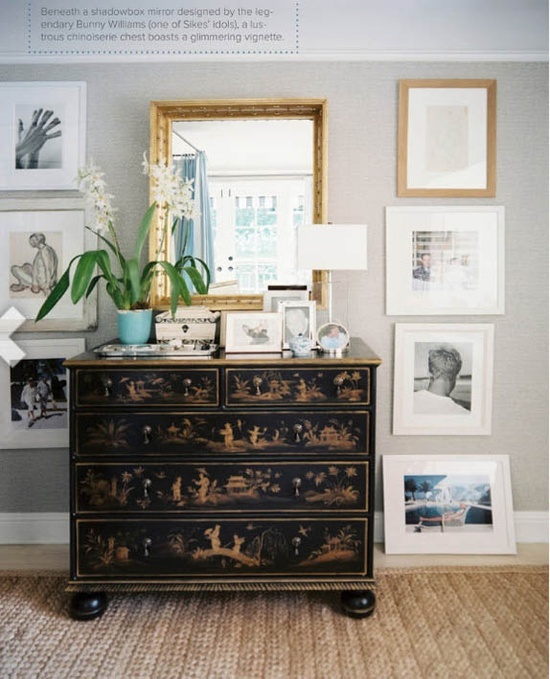 Totally agree here: modern meets antique is the best mix. I love all your inspirations. That first photo with the abstract painting, which I want by the way is stunning. Mixing, definitely! Much easier to decorate that way...anything goes. ha! I like mixing it up - I just work with it till I like it! Not sure there is a definition for my 'style'! You always collect such beautiful photos. I love the "best of both worlds" style too! I like the industrial lighting in the white kitchen - gorgeous! I'm with you Pam, love to mix it up. I love this look, too. The mix of it makes it feel warm and fresh. I absolutely love the mix! Keeps one foot in our past and the other in the now! Big fan of the mix! Couldn't agree more! Sick of snow yet, Pam? Love the mix of antique and modern. It's just a glorious combinations. LOVE this look... love love love! that kitchen with the very distressed island- SWOON! you are speaking my language. The MIX makes it real! Gives the space personality! Without a blend of styles, textures, etc. the effect is too sterile! It's not always easy, but a successful room looks like a collection of the owners' life! Oh yes Pam! I agree with you on this, I have yet to get a big antique piece for my home though. So far, I only have been lucky to find little things for my home, just like the big brass dolphin I just recently scored! I want to pin them all but decided on the worn island kitchen just stunning. Modern meets antique perfect!!! You've read my mind! This is just the look I've been so drawn to lately. Now to work toward incorporating it. Thanks for the inspiration! Love the mix! I can't go too modern with out a touch of tradition or antique, and vise versa! 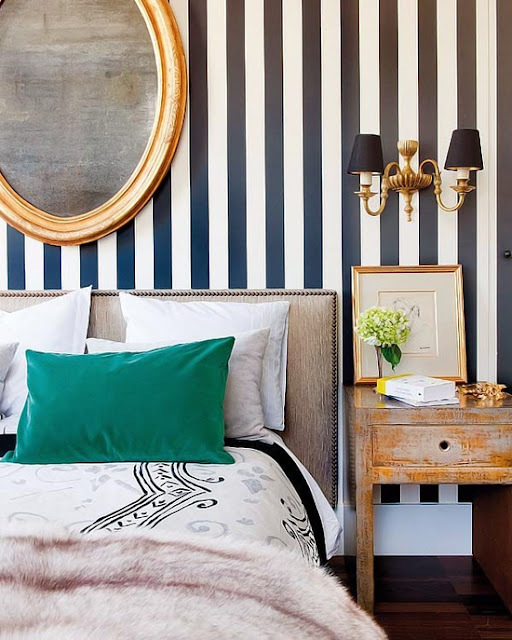 My home is definitely eclectic...a mix of modern/traditional and antique pieces...I love the gorgeous sconce with that nailhead trimmed headboard and the striking black and white striped wallpaper...just stunning! I absolutely love this style - the style of mixing up what you love. Older pieces bring in so much character to a space - and yet new fabrics and pieces make it fresh. Great examples. I would love an old chippy island in a brand new kitchen! Yes, yes, yes - I love the mix. I've gotta figure out where I'm going to put our Windsor bench in our next house. It's one of my favorite pieces of furniture. In the world of interior remodeling you seldom find good designers who can mix antique and modern with class. You certainly have pulled it off, congratulations! I noticed the striped patterns. Although I am not fond of anything with stripes, the pictures look good. I'm definitely going to try using this pattern in one of my exterior remodeling projects.